Philosophical Instrument for Newton's lecture. Special Features: Illuminated Base and "Rocking" Vessel. Materials: Lacquered Honduras Mahogany; Machined Brass, Tektite (glass meteor), Glass Level Vial, Compass, and Plastic; Electroluminescent Panel and Electric Motor. Loci Newtonia became an instrument for a lecture by Newton. Newton as the scientist and Newton as the alchemist. While I love the mystery of the elements brought together they all came from an interpretation of simple Newtonian concepts. The most notable feature is the vesica, or vessel like form, that rocks back and forth like a metronome might. Keeping time it references the cosmic time that Newton was so intrigued by. That element also incorporates a dotted line mast with a turned pointer that aims at the celestial globe of Newtons intrigue and a coned base pointing towards his earth. A possible starting point for a rambling lecture on cosmic objects or our place. While marking time the vesica also demonstrates some simple mechanics and linkages that might lead to some simple discussion of time, motion, action, reaction. This primary element is surrounded by simple devices indicating a larger whole. 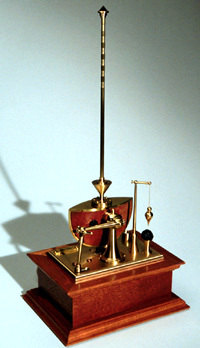 The plumb bob, elegant and simple as it is, points towards the center of the mass of the planet and, in this case, a planetoid object; the tektite which, by some accounts, is formed when earth materials are flung into near space by a meteorite impact, coalesce, and then reenter the atmosphere and fall to earth (many showing flight markings). Directly behind the plumb bob/planetoid is a simple compass. Actually a dressed up toy compass like the ones I played with as a child. The compass, in all its mystery (especially in Newton's time), references the magnetic fields surrounding us. It becomes a perceptual aid for us and, like the plumb bob, one of the simplest. To the left of the vesica is a spirit level. Serving about the same purpose, once abstracted, as the plumb bob, it makes note of their use in early instruments. And under the vesica is an electro luminescent panel that creates the sea for the vessel with a nod to electrical energy, glowing phosphors, the night auroral sky, or any number of glowing things we have so long been intrigued by. I imagine lecturing a small group, while progressing slowly through all of these elements, raising questions with no answers.